Most romances focus on the hero and heroine. M.C. 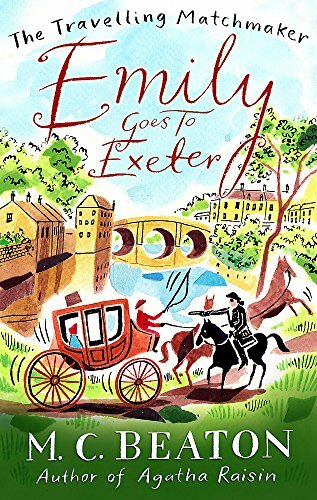 Beaton's Emily Goes to Exeter, the first in the Travelling Matchmaker series, is not like most romances. Instead of centering on the couple at hand, this story takes as its main character Miss Hannah Pym, the long time housekeeper of the late Mr. Clarence of Thornton Hall. It's 1800 and Miss Pym is fascinated by the stage coach, "flying machines," that gallops past the estate every day on its way to Exeter. Upon receiving a bequest in Mr. Clarence's will and encouraged by his kindly brother, she can finally indulge her greatest romantic fantasy, travelling by said stage coach. She arranges her affairs and sets out on what turns into quite an adventure. When the coachman runs the coach into a rut and a storm blows in, the passengers of the coach are stranded at a local inn where the proprietor's wife is under the weather herself. Miss Pym proves to be a keen observer of human nature and a woman of action, taking charge of both the inn and her fellow passengers to keep things running smoothly. She has to contend with one spoiled society miss, badly disguised as a young man, trying to run away from the match her parents have made for her, the match himself, a widow fearful of life alone and the bully she's eloping with, a mild mannered lawyer, and several others as well. As she watches her fellow passengers, she quietly determines to help them along in their romantic lives. Hannah is a mightily capable character. She's smart and compassionate and thinks the best of almost everyone. She's also a bit of a busybody and it's easy to see that she is perfect as an accidental matchmaker. Her delight in the little freedom that riding the stage coach gives her is infectious. The plot is full of hijinks and the story gives off a feel of true joie de vivre. There's nothing very complicated here and the brevity of the tale means that the other characters are of necessity sketched only in broad outlines but it's a short, light, and charming book for those who are looking for a little lovable sweetness in their historical romances. Oh, it sounds so interesting!